Here is another recipe from BakeorBreak, on which I spend hours of time looking at things that I just have to make. I'm sure I'll be sharing more from there in the future, but for now we have chocolate chip muffins! As goes the eternal debate: muffin or cupcake? I'm here to settle the argument once and for all. Muffins are denser, often have fruit add-ins, streusel toppings, and are made with melted butter. Cupcakes are frosted, can have a jam center but usually not other additions, and are made with softened butter, and are therefore lighter in density. 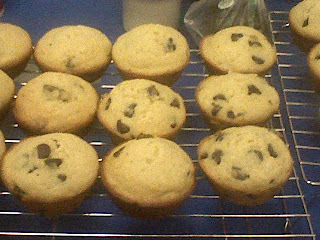 So these are muffins, which, by having chocolate chips in them kind of breaks from the rules - but not so much. You can still eat them for breakfast, I promise. Anyway, back to these chocolate chip muffins: I made a double batch and brought half of them to work and half of them to class. They were well received (but really, what free baked good isn't?) and I think they were good, but not mind-blowingly so. But they were a good muffin, so what more am I searching for? Who knows. I'll let you know when I do. In the meantime, enjoy these muffins. Tip of the Day: Subsitute chocolate chunks for chips if you're looking for a more sophisticated dessert. Stir together the flour, sugars, baking powder, baking soda, cinnamon and salt. In a separate bowl, mix together the eggs, butter, milk and vanilla. Add to the flour mixture, stirring until just combined. Divid batter among 12 greased muffin cups. Bake on 375F for 20 to 22 minutes.